Maxim S.O.S. Carpet and Rug Protector is specially designed to protect nylon or wool rugs and carpets without the use of smelly solvents, fluorochemicals or resoiling silicones. It contains a highly concentrated, anti-staining polymer that coats fibers and prevents staining agents like red wine, grape juice and Kool-Aid from permanently bonding to the carpet fiber. Two additional ingredients, an anti-resoiling, anti-wicking polymer and an odor-neutralizing agent, ensure complete customer satisfaction. The anti-resoiling polymer makes the fibers less “sticky”, causing soil that would normally attach to carpet fiber, to slide off instead so that it is then easily removed through vacuuming. A feature unique to Maxim S.O.S. Carpet and Rug Protector is the odor-neutralizing agent that helps eliminate unpleasant odors associated with wet carpet. This neutralizing agent is paired with a light citrus scent that creates the best smelling protector available. 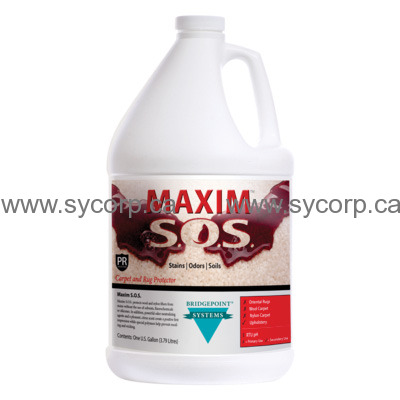 From first smell to long-term protection against stains, Maxim S.O.S. Carpet and Rug Protector is the answer for technicians looking for a protector that is silicon, fluorochemical and solvent free. STAINS: Protects wool and nylon fibers from stains without the use of solvents, fluorochemicals or silicones. ODORS: Contains neutralizing agents and a pleasant, citrus deodorizer to create a positive first impression. SOILS: Special polymers help prevent resoiling and keep carpets cleaner, longer.